1.For automatic dishwashers because they make it possible for them to get out of the kitchen before the family comes back in for their after dinner snacks. 2.For husbands who attack small repair jobs around the house because they usually make them big enough to call in the professionals. 3.For children who put away their things and clean up after themselves. They’re such a joy you hate to see them go home to their own parents. 4.For teenagers because they give parents an opportunity to learn a second language. 5.For smoke alarms because they let you know when the turkey’s done. Now our list might not be the same as theirs, but I’m convinced that if we began to make a list, we would find that we have much more for which to be thankful than just our material possessions. Most of all, I’m thankful for our salvation, our family, our church family, and the mercy that God showers upon us each day. With Jesus we have so much to celebrate with Thanksgiving! As you think about everything He has given you, does it make you just want to burst out with praise and thanksgiving? If it does, you are Scriptural. Ps 100:1-5 Shout for joy to the LORD, all the earth. Worship the LORD with gladness; come before him with joyful songs. Know that the LORD is God. It is he who made us, and we are his; we are his people, the sheep of his pasture. Enter his gates with thanksgiving and his courts with praise; give thanks to him and praise his name. For the LORD is good and his love endures forever; his faithfulness continues through all generations. I believe we are a nation that has truly been blessed by God. But has it ever occurred to you that no Americans were more underprivileged than that small handful from the Mayflower who started the custom of setting aside a day of Thanksgiving to Almighty God 400 years ago? Fifty-three of the 102 that landed died the first year from pneumonia. They had no homes and no government agency to help them build homes. They had no means of transportation but their legs. Their only food came from the sea and the forest, and they had to get it for themselves. They had no money and no place to spend it if they’d had any. They had no amusements except what they made for themselves, no means of communication with their relatives in England, no social security, or Medicare. They were just thankful to be alive. However, they did have four characteristics that we find lacking in many people today: initiative, courage, a willingness to work, and a boundless faith in God. That almost sounds strange in a society where powerful forces are at work to strip us of every reminder that our nation was built upon the conviction of "one nation, under God." 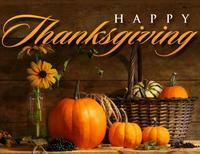 Thanksgiving Day is a distinctive holiday. It is my favorite of the year. It doesn’t commemorate a battle or anyone’s birthday or anniversary. It is simply a day set aside to express our thanks to God. In 1789, George Washington made this public proclamation. Here is part of it. "Now, Therefore I do recommend and assign Thursday, the 26th day of November next, to be devoted by the People of these States to the service of that great and glorious Being who is the beneficent Author of all the good that was, that is, or that will be. . ." So read the very first Presidential Thanksgiving Proclamation. This week we will pause once again to celebrate a day of Thanksgiving. One would assume that because of the example of our forefathers, and because today we have so much, that we would be an extremely thankful people. But it is just the opposite, isn’t it? We have more stuff, but we have less of God. The more we get, the less thankful we become, the less mindful of God we are, the more stuff we want, and we want it given to us—now! Our godless media has desecrated Thanksgiving Day by calling it “Turkey Day.” To businesses and shoppers it is a holiday that is in the way of the Christmas season. Stores can’t wait for Black Friday anymore. This year some are going to start their sales on Thanksgiving Day. There’s no time for Thanksgiving, besides it is just “Turkey Day,” and why celebrate a turkey. God warned His people about this. Deut 8:11-14 Be careful that you do not forget the LORD your God, failing to observe his commands, his laws and his decrees that I am giving you this day. Otherwise, when you eat and are satisfied, when you build fine houses and settle down, and when your herds and flocks grow large and your silver and gold increase and all you have is multiplied, then your heart will become proud and you will forget the LORD your God, who brought you out of Egypt, out of the land of slavery. Psalm100 was written to deal with that attitude, to remind us of our need to be thankful, and to maintain an attitude of gratitude. Did you notice to whom Psalm 100 is addressed? The first verse says that it is addressed to "all the earth," and the last verse says that it includes "all generations." This message of thanksgiving applies to every person in every era in every stage of life. However, there is a real danger of determining our thanksgiving on the basis of how much we possess. Matt 6:19-21 "Do not store up for yourselves treasures on earth, where moth and rust destroy, and where thieves break in and steal. But store up for yourselves treasures in heaven, where moth and rust do not destroy, and where thieves do not break in and steal. For where your treasure is, there your heart will be also. The only thing we possess for sure is our relationship with the Lord; however, that is plenty for which to be thankful. As we look more carefully at Psalm 100, we find that there are 5 commands given. The first command is in vs. 1, "Shout for joy to the Lord, all the earth." It means to "shout forcefully," with a shout of joy to the Lord that comes from our heart. From the depths of our being we proclaim our praise. We realize that God has been so good to us that we can’t keep it inside any more. Isn’t it strange, we don’t have problems shouting forcefully at a football game, but we seldom quietly say “Praise the Lord” in church. God wants us to be excited and joyful about who He is, what He has done, and what He is going to do. The second command is, "Serve the Lord with gladness." It doesn’t say "serve the church." It doesn’t say "serve the elders or serve the organization." It says, "serve the Lord," and do it with gladness. He walks with me and talks with me, along life’s narrow way. We can serve and worship the Lord with gladness everyday and in every circumstance as we focus on Jesus and this truth—He is alive! The third command is, "Come before Him with joyful songs." Have you noticed? In these first 3 commands, we are to express the joy of the Lord. Shout with joy, serve with gladness, and come with joyful songs." Command #4 is, "Know that the Lord is God. It is He who made us, and we are His; we are His people, the sheep of His pasture." We are to make God ruler, master, and boss of our lives. God told Moses, ‘I AM WHO I AM’” (Exodus 3:14). We have no more control over God then we do over the weather or climate change. God is God and we are not. People have forgotten this fact. God is our CREATOR. If you create something, you are greater than what you have created. You have every right over that which you have made. God made us and He is still making us. That is important to realize, too. He’s not finished with us. He’s renewing our mind. He’s creating within us a new spirit, a new personality to reflect Jesus Christ. He’s still making us. He’s still working on our lives. God is our maker, and we are created in His image. Therefore, give Him thanks for who you are and who you will become. Then He says, "We are His people, the sheep of His pasture." It’s not any fun being sheep, we think. But the problem is, we don’t know where the still waters and green pastures are. And every time we go out searching for them, we invariably end up in the far country. John 10:10-18 The thief comes only to steal and kill and destroy; I have come that they may have life, and have it to the full. "I am the good shepherd. The good shepherd lays down his life for the sheep. The hired hand is not the shepherd who owns the sheep. So when he sees the wolf coming, he abandons the sheep and runs away. Then the wolf attacks the flock and scatters it. The man runs away because he is a hired hand and cares nothing for the sheep. "I am the good shepherd; I know my sheep and my sheep know me--just as the Father knows me and I know the Father-- and I lay down my life for the sheep. I have other sheep that are not of this sheep pen. I must bring them also. They too will listen to my voice, and there shall be one flock and one shepherd. The reason my Father loves me is that I lay down my life-- only to take it up again. No one takes it from me, but I lay it down of my own accord. I have authority to lay it down and authority to take it up again. This command I received from my Father." Command #5 is this, "Enter His gates with thanksgiving, and His courts with praise; give thanks to Him and praise His name. For the Lord is good and His love endures forever. His faithfulness continues through all generations." In the Old Covenant the temple symbolized the presence of God. So whenever the people came to the temple and entered the courtyards, they knew that they had come into the presence of God. Now that temple no longer exists. But God is everywhere. Under the New Covenant, He is with you as you drive on the highway. He is with you when you work. He is with you as you care for your children. He is with you every moment of your life. He is with us now. The Lord is good. His love endures forever. His faithfulness continues through all generations, even when we are unfaithful. Those are plenty of reasons to express thanksgiving and praise Him. If Psalm 100 doesn’t point out enough reasons for us to give thanks, praise, and worship to God, let me add a few more reasons from the Word. First of all, Almighty God is worthy of our thanksgiving, praise, and worship. Ps 18:3 I call to the LORD, who is worthy of praise, and I am saved from my enemies. We are called to thank, praise, and worship God. 1 Peter 2:5, 9 You also, as living stones, are being built up a spiritual house, a holy priesthood, to offer up spiritual sacrifices acceptable to God through Jesus Christ. But you are a chosen generation, a royal priesthood, a holy nation, His own special people, that you may proclaim the praises of Him who called you out of darkness into His marvelous light. Thanksgiving, praise, and worship defeats our enemy. Our praise puts evil to flight. Ps 8:2 From the lips of children and infants you have ordained praise because of your enemies, to silence the foe and the avenger. How are we to praise, worship, and give thanks to the Lord? Ps 63:3 Because your love is better than life, my lips will glorify you. Ps 63:4 I will praise you as long as I live, and in your name I will lift up my hands. Ps 95:6 Oh come, let us bow down in worship; let us kneel before the LORD our Maker. I pray that you will give thanks, praise, and worship to God this week. Doing this will make a meaningful Thanksgiving for you and all your family. I also pray we will celebrate Thanksgiving everyday of the year. Take time to read the 100th Psalm again. If we will heed those commands, our heart will overflow with thanksgiving to the Lord everyday and in every circumstance.